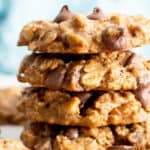 Pumpkin Chocolate Chip Oatmeal Breakfast Cookies (V, GF): An easy fall recipe for soft, chewy pumpkin oatmeal cookies packed with chocolate chips and pumpkin seeds. Perfect for breakfast or an afternoon treat! One Bowl, Vegan, Gluten Free, Dairy-Free, Breakfast. Do you have any morning routines that make your morning a bit less crazy? I’ve been hearing about all kinds of tactics: meditation (come on, J.Lo does it, so it must work), 10-minute yoga session, journaling (Erik does this, so it’s 55% likely to work—j/k, Buttercup! ), hiding in the bathroom till everyone goes away (a personal favorite of mine), and finally, running away to a serene getaway where cartoon birds sing you awake and prepare breakfast (while not touching it because that would be gross). My favorite new tactic for dealing with these crazy mornings is… wait for it… COOKIES! 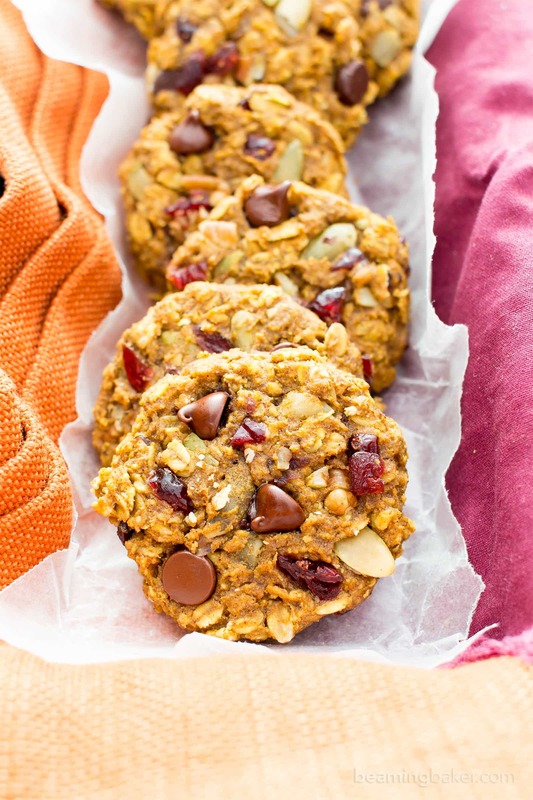 Let me not think about that as I munch on these Pumpkin Chocolate Chip Oatmeal Breakfast Cookies. 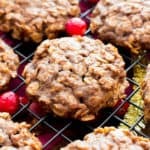 Some folks have even taken to making my tastiest no bake cookies for breakfast, too. Which totally had me thinking, why didn’t I think of that? Meanwhile, it’s been pumpkin all day, e’ryday for a few weeks now, and I’ve been semi-patiently sharing/staggering in a normal-ish manner my favorite pumpkin recipes with you. 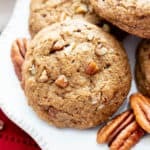 There’s been maple pecan pumpkin muffins, moist gluten free chocolate pumpkin muffins, chocolate pumpkin bread (Erik’s current fave), and my all-time favorite throwbacks: classic gluten free pumpkin bread and even pumpkin pie smoothies. This might just be the last pumpkin recipe for the year—but don’t put me on record as saying that or anything. Ya never know, I still have obscene amounts of pumpkin lurking in my house. 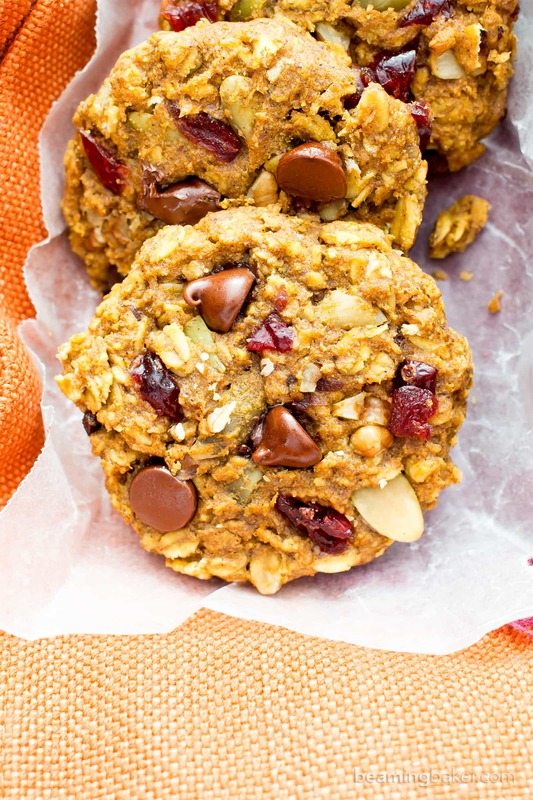 These cookies combine two of my family’s current faves: pumpkin and breakfast cookies! I’ve been making them nonstop (hence, all the lurking pumpkin). They’re seriously so good fresh out of the oven—soft, moist, chewy, and oh-so-satisfyingly warm. 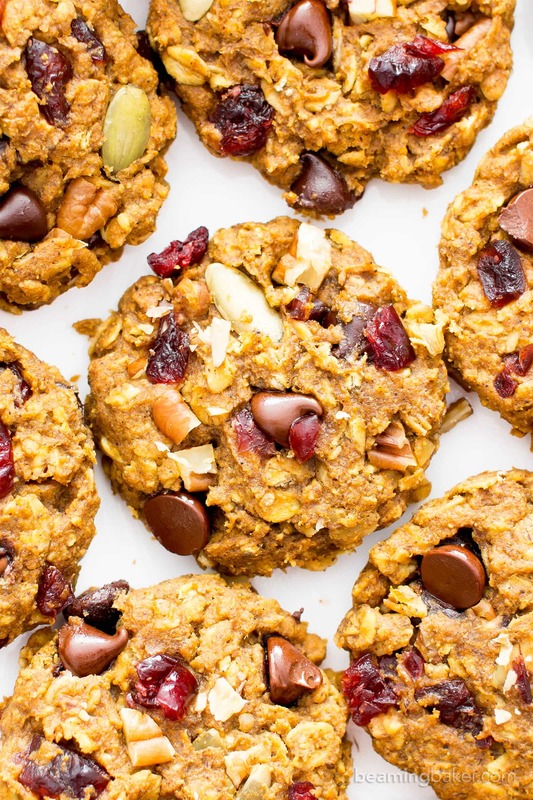 There’s just something about melting chocolate chips nestled in the folds of chewy oats, sweet ‘n tart cranberries and crispy pumpkin seeds that just does it. See what I mean about that good morning? 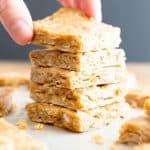 And if you want to make these in advance, because, let’s be real, not many of us have time to fresh-bake a treat every morning, go ahead and warm one up for 10-15 seconds in the microwave. Speaking of warming them up in the microwave, you have to try it with my Easy Gluten Free Vegan Dark Chocolate Muffins. The taste is out of this world! ???? Wait, what was I saying? Oh yes. 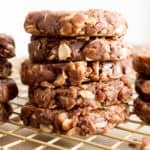 These make-ahead breakfast goodies are amazing—just like you had time to bake like a boss, and get dressed, and get the kids ready, and actually brush your teeth/floss/comb your hair in the morning. I, myself, don’t have kids and all of that streudel is a struggle in the AM. Ah, mornings. What can I say? I need these cookies to make them just a tad saner. Meanwhile, don’t forget to tell me about your serenity tactics for a calm morning. 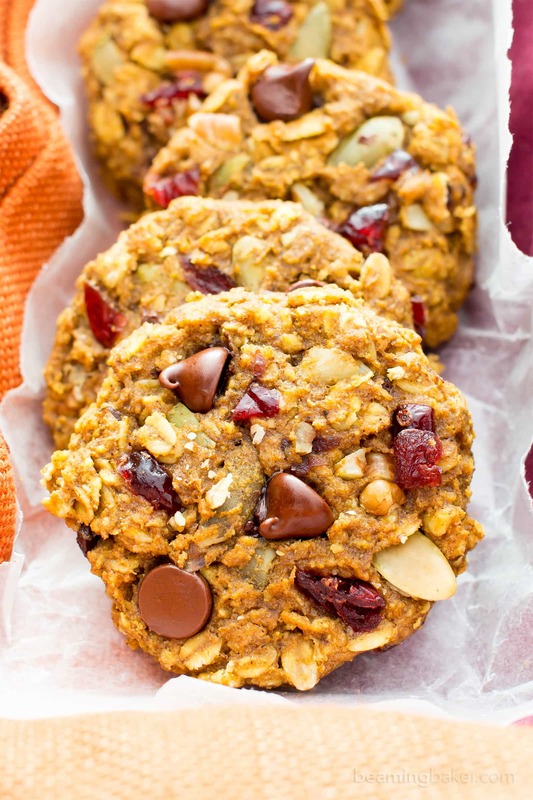 Oooh, now I just wanna call the entire morning off and just binge watch Serenity with a big ol’ bucket of olive oil popcorn and these Pumpkin Chocolate Chip Oatmeal Breakfast Cookies. Or perhaps a big plate of Gluten Free on a Shoestring’s wonderful Gluten Free Pancakes? With flax eggs and non-dairy milk subbed in to make ’em vegan. 😉 And maybe two loaves of this Healthy Chocolate Chip Pumpkin Bread from Healthy Seasonal Recipes… With flax eggs instead of eggs and vegan chocolate chips to make them vegan. ???? What’s your favorite way to kick off an awesome morning? 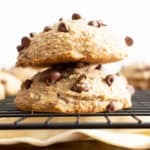 Pumpkin Chocolate Chip Oatmeal Breakfast Cookies (V, GF): An easy fall recipe for soft, chewy pumpkin oatmeal cookies packed with chocolate chips and pumpkin seeds. Perfect for breakfast or an afternoon treat! Vegan, Gluten Free, Dairy-Free, One Bowl. Preheat the oven to 350°F. Line a large baking sheet with parchment paper or greased foil. Set aside. Add the wet ingredients to a large bowl: pumpkin, coconut oil, peanut butter, sugar, maple syrup, flax egg, and vanilla. Whisk until well incorporated. Add the dry ingredients: oats, oat flour, baking soda, baking powder, cinnamon, cloves, nutmeg and salt. Whisk together until just thoroughly combined. When it gets difficult to whisk, switch to folding with a rubber spatula, until no flour patches remain. Fold in Add-in Ingredients. Using a 2-tablespoon cookie scoop, scoop and drop cookie dough onto prepared baking sheet, evenly spaced apart. Press Toppings into the top of each cookie. Using a fork, flatten cookies to desired thickness—they will not spread during baking. Periodically clean the fork off between flattening—the dough is sticky. Bake for 10-14 minutes. Mine took 12 minutes. Allow to cool on a cooling rack for about 30 minutes, or until completely cool. Enjoy! Storing instructions below. 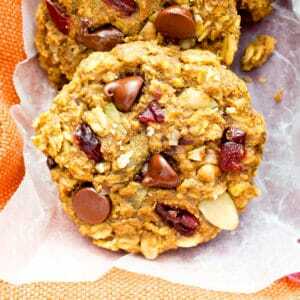 - Adapted from my Peanut Butter Banana Breakfast Cookies and my Pumpkin Chocolate Chip Oatmeal Breakfast Bars. - *All can be substituted with 1¼ teaspoons pumpkin pie spice. - Freezing instructions: store in an airtight, freezer-friendly container in the freezer for up to 1-2 months. Allow to thaw for 10-15 minutes before enjoying; or heat in the microwave in 10-second increments until warm. 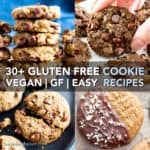 - More plant-based, allergy-friendly Pumpkin recipes: one bowl pumpkin bread, pumpkin chocolate chip muffins, pumpkin pie smoothie, chocolate pumpkin bread. 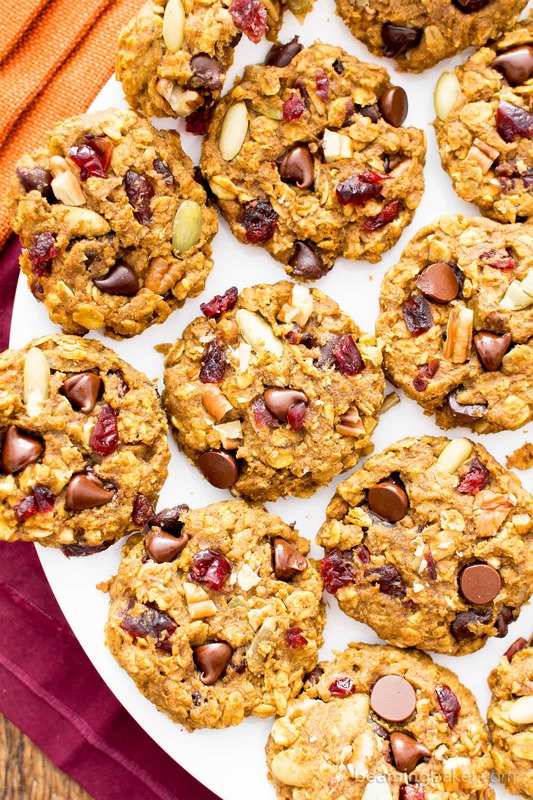 Seriously needing a whole batch of these cookies for chilly fall mornings 😀 Can’t wait to try them! They’re the perfect treat to help warm you up! Can’t wait to hear what you think! Wondering if a substitute like almond butter could be used instead of peanut butter. I’m very allergic to peanut. Can you substitute the flax egg for regular egg? I am so happy to have found you. I am a pumpkin fanatic!!! I was recently tested and confirmed to have some significant food intolerance’s, dairy, eggs, bananas, cod, mushrooms, gluten(mild) and refined sugar. I can’t wait to try some recipes as I also am training for an Ironman and am struggling to meet my macros. By any chance, does your recipes so the macros so I can track? I’m so happy to have you here, Kelley! 🙂 Pumpkin fantatics unite! Hehe. So sorry to hear about your food intolerances–but glad that you’re here. You can to the right place! As of right now, I’m not calculating macros. I’m currently working on adding nutritional info across the site. Perhaps plug this recipe into the MyFitnessPal recipe parser (lets you add the URL and will input the recipe for you) and add to your food diary to get the macros that way? Good luck! Can’t wait to try this, sounds delicious! 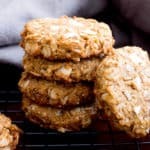 Chewy, moist and warm cookies straight from the oven is – the best – and if they could be a little bit healthier too, that would be amazing. Thank you for the recipe! Thank you, Stine! 🙂 Healthy, guilt-free treats are my specialty–life is too short to feel guilty for having a little something sweet. 😉 Enjoy! Could oat bran be subbed for the oat flour? Thank you! Hi Kristin, I’m not sure what the results would be like since I’ve never tried it. Be sure to let me know how it turns out if you do! Good luck! I know pumpkin season is over, but had some frozen, so made these. FANTASTIC! Good enough not to just confine them to breakfast—good as dessert as well. Moist and flavorful, just brimming with goodies! I did have them for breakfast, along with a bowl of stewed apples with maple creama sauce (made with silken tofu). Yum, just yum. “Good enough not to just confine them to breakfast” <-- love that! So happy to hear that another one of my recipes has met your approval, Ellen! 🙂 Can you feel me beaming? 😉 That bowl of stewed apples sound absolutely amazing! P.S. I am STILL enjoying all the pumpkin treats too, pumpkin season or not! These are amazing! I used quinoa flour and a little coconut flour and they turned out great! Yay!! Glad the quinoa and coconut flour worked. 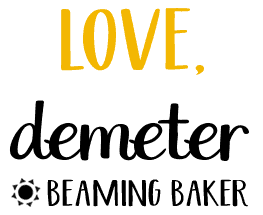 🙂 Happy baking! 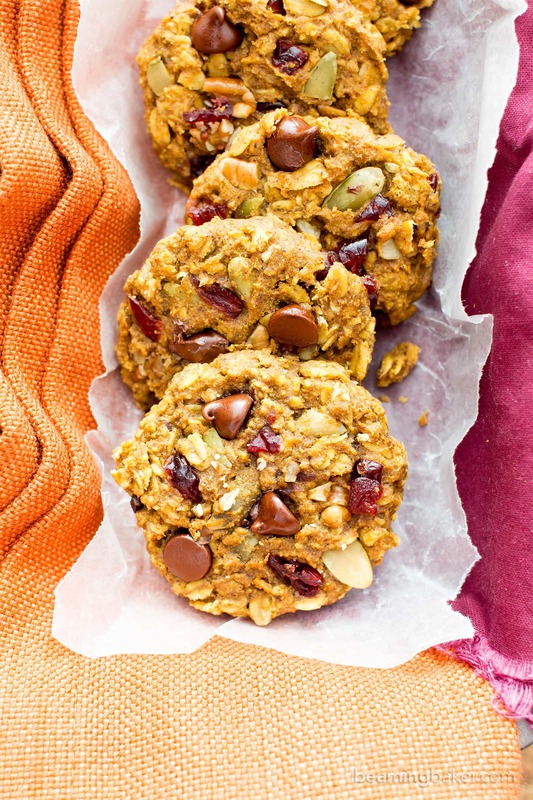 These cookies look like the perfect quick breakfast on busy days! 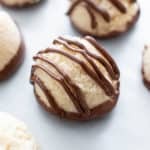 So delicious and easy to make! 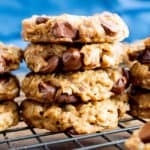 Can I substitute the oat flour with almond flour? This recipe looks lovely! Thank you! These are so good. I used butter instead of peanut butter (son is allergic) and coconut oil (sorry vegans) & they are still amazing!!!!! Yay! So happy to hear you enjoyed the cookies Sara! ???? These look seriously amazing! Thanks for creating such fantastic recipes! P.s. in step number 3 there is a html error. Thanks Christina! Oh gosh, thanks for catching that. Fixing it now. Hugs! Hi Alice, yes, I think you’d be able to substitute the maple syrup and coconut sugar with honey. Maybe leave out 1 tablespoon, as the honey will add more moisture than the sugar will. Good luck! I was thinking about making a pumpkin cookie sweetened with overripe bananas and stumbled upon your recipe. I did not want to use a sweetener and substituted overripen bananas for the sweeteners, use canola oil for coconut, and added some nutritional yeast. I really enjoyed these. The texture and the flavor were good.